Allow me to introduce myself. I am Simone de Belle Chat, the dominant feline in the household of acclaimed erotica author Lisabet Sarai. Of course, I am using a nom de plume in order to protect my anonymity and Lisabet's. I do not want assorted furry riffraff mobbing my Facebook page and pleading to be my friends. Lisabet is insanely busy this week, so she asked me if I would be willing to step into her slot at Hitting the Hot Spot. She suggested that an appropriate topic might be "living with a writer". I was only too happy to oblige. It is fairly rare that I get the opportunity to expound on the pivotal role I play in Lisabet's writing. Only one of her books mentions me in the dedication, but she could not have reached her current pinnacle of success without my support and guidance. To begin with, I assist her in maintaining the requisite level of organization on her desk. I insist that she reserve sufficient space, available at all times, for me to sit and supervise her efforts. When I decide that the pile of folders and notebooks on the corner of the desk has grown too tall, I take decisive action to encourage her to deal with the problem Papers scattered all over the floor simply cry out to be filed in the proper places. She pretends to be angry, but I know that, deep down, she appreciates my efforts. I also insure that she keeps her screen and keyboard clean, by the simple expedient of scattering them with fur on a regular basis. In the old days, before she began using a laptop, she had to disassemble her keyboard every few months and vacuum out the interior to prevent the keys from sticking due to the tufts of cat hair blocking the switches. That has not been necessary thus far with the ThinkPad, but I know that she recalls the possibility every time I flick my tail across her fingers as she types. One critical responsibility that I take very seriously is helping Lisabet to relax. When she is working against a deadline, she may sit and write for hours at a time, her shoulders hunched and her brow knitted in thought. I know that she will be sorry later if she does not get up and stretch. I keep a sharp eye on the clock, and when I decide that she needs a break, I will reach out a well-aimed paw and send her pen flying off into the middle of the room. My precision strike never fails to make her smile, and of course, she has to stand up in order to retrieve the pen. Then she will pet me for a while, exclaiming at the beauty of my velvety fur and my bright topaz eyes. When she returns to her computer, she is relaxed and rejuvenated, thus corroborating the abundant research that indicates cats reduce stress. Do I influence the content of Lisabet's stories? Not as strongly as I would like. There is a cat in her novel Necessary Madness, a tuxedo tom who is a witch's familiar, and another in (a rather scruffy and mischievous tiger) in Incognito, but Lisabet has yet to create a story with a feline heroine. I do make allowances for the fact that most of her readers are human, but she could try her hand at a cat shape-shifter, couldn't she? In any case, it is not uncommon that she describes a character as having “feline grace”. In fact one might quibble that she uses that phrase too often, but it is, after all, supremely appropriate, n'est ce pas? The eroticism in Lisabet's writing does not disturb me in the least. Even the most elegant and refined cat (such as I am) is randy enough to make human lust seem tame by comparison. It pleases me when she uses animal metaphors to describe humans in the throes of passion. I only wish that I could communicate to her the exquisite sensation of having a tom grip the ruff of your neck while battering your upraised haunches. One of the nice things about being feline that we are naturally polyamorous. Vive l'amour, I always say. I have been focusing on the benefits that Lisabet derives from having me in her life. To be honest, I must admit that the situation is favorable from my perspective as well. Since she spends significant periods of time at home at her computer, I am rarely lonely. (When she is away, I do have Mr. Toes, the other cat in the family, for company, but he is far less articulate than Lisabet.) She always makes me feel welcome when I jump up onto her desk and curl up against her warm laptop. She personally feeds me and changes my litter, recognizing that a fastidious cat such as I requires the ultimate in hygiene. Once a year she brings me to the vet for my annual checkup and immunizations. Although I complain bitterly, I am grateful for her dedication to keeping me healthy. Our apartment has a balcony and our potted plants attract quite an assortment of tasty looking birds. When I am weary of serving as Lisabet's muse, I can sit for hours watching the show. All things considered, Lisabet and I have an excellent arrangement. If there are any cats out there in cyberspace who are considering entering into a relationship with a writer, I highly recommend it. I must say, Simone, you do impress as a most fastidious lady. For my part, I am a rough-n-tumble guy who once kept my mother from her writing for a rather long time by the simple expedient of coming home with a badly broken leg. Mother said words I have never heard before and then tortured me with being confined in a crate with an intravenous drip! Worst of all, it was a DOG crate. Horrendous! Now I rest in her office, occasionally biting her in retaliation. Oh, she meant well, I suppose. Stupid humans. What a pleasure to hear from another literary feline! I do hope that your leg is well-healed by now and that you are doing your part to keep your human on her toes. Perhaps we may encounter each other in our wanderings. Alas, dear Simone, my wandering ways were severely curbed by my overly-concerned human who thought I should be confined to the house. Since my leg healed beautifully, however (thank you for your concern), it was a simple matter to jump to the top of the offending DOG crate which is beneath a window. With my impressively sharp teeth and claws I made a cat-sized hole in the screen and escaped. Once I discovered how convenient it was, I made another one in the basement window screen to return. I now have a most delightful thru-way that a shiny red cardinal bird used to access the basement, which it circumnavigated a number of times with me in hot pursuit and Mother screaming those dreadful words at the top of her lungs. She is not a fastidiious lady such as you are. I do hope she doesn't write those words in her books! Hey, Simone, I am with you on the clearing the desk trick. 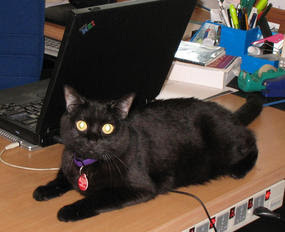 My human still hasn't learned that the portion of the desk in front of her monitor belongs to me. I keep trying to train her but some humans just don't seem to respond. Fondly, Big John, who used to be called Little John, but I am proud to say I outgrew that name.